We’d love your help. 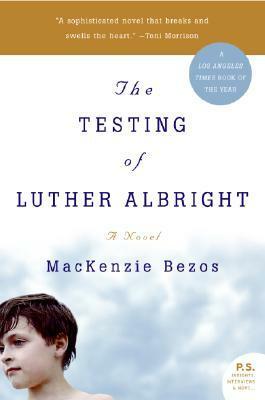 Let us know what’s wrong with this preview of The Testing of Luther Albright by MacKenzie Bezos. Luther Albright is a devoted father and a designer of dams, a self-controlled man who believes he can engineer happiness for his family by sheltering them from his own emotions. But when an earthquake shakes his Sacramento home, the world Luther has constructed with such care begins to tilt: his son's behavior becomes increasingly bizarre and threatening, his loving wife se Luther Albright is a devoted father and a designer of dams, a self-controlled man who believes he can engineer happiness for his family by sheltering them from his own emotions. To ask other readers questions about The Testing of Luther Albright, please sign up. I think it's pity when good books frequently get low star ratings because some readers want a conventional 'plot' with lots happening. The 'story' can be the unfolding of consequences of characters' actions and/or events that have happened to them. A good writer will detail emotions, regrets and lessons learned, often too late. In the case of Luther Albright over- thinking, second guessing and repression add up to the loss of both family respect and his own self worth. As the book progressed, I I think it's pity when good books frequently get low star ratings because some readers want a conventional 'plot' with lots happening. Like an artist mixing colors on her palette MacKenzie brings an array of color to the life of Luther Albright. I really felt I was peeking in on someone else’s daily existence. I thoroughly enjoyed how the book developed from beginning to end. It’s nice to see a book written from the view point of someone living life like the rest of us. Happy reading! Not a good book. Luther is married with a teenage son, Eliot. Luther doesn't open up to him. They do plumbing together. Wife gets a job. I finished it to find out what happens but nothing does! Almost nothing "happens" in this book, but it is a deeply moving, intimate picture of the daily interactions and struggles between father and son. It is amazing, from my point of view, how a woman author writes in a first person male protagonist. The story reverberates of how many trials a father can be. I choose this book in the store over the book The Beautiful Boy: the Father's Journey Through His Son's Addiction by David Sheff, because it almost the same in topic--parental love and other things we perceived wrong about their love but it is not good to compare books. It will remind you of your/ the role as a father or parent, spouse and It is amazing, from my point of view, how a woman author writes in a first person male protagonist. It will remind you of your/ the role as a father or parent, spouse and a friend. The testing is not about written exam but simply a trial of behaviors and consequences. In particularly I learned the meaning of "silent treatment" in other view and how it resulted from your past life and not all of silent treatment can be based as negative but only the limitation of our understanding of what we see and not we actually feel--love. This book reminded me so much of Stoner by John Edward Williams. It's also a very quiet book. It's about a man, a proud but quiet man who builds dams in CA. He lives with his family in a house that he built with much love and care, but now it is aging and in need of many repairs. A major dam that he has built is being investigated for design flaws. Confronted with pressure at work and his own difficulty sharing articulating his feelings, his wife becomes distant and his adolescent son starts act This book reminded me so much of Stoner by John Edward Williams. It's also a very quiet book. It's about a man, a proud but quiet man who builds dams in CA. He lives with his family in a house that he built with much love and care, but now it is aging and in need of many repairs. A major dam that he has built is being investigated for design flaws. Confronted with pressure at work and his own difficulty sharing articulating his feelings, his wife becomes distant and his adolescent son starts acting out. It's a story about a pretty ordinary man, being severely tested at a time in his life, when he perhaps expected more peace, just trying to do the best he can. This book is a sad case of literature. The author writes beautifully, but somehow missed that she needs a plot in order to make a good story. She alludes to a plot and you keep thinking that something is going to happen at the end, but you are left sorely disappointed. Picked it up beacuse it was set in my old hometown. Thought it was going to be a little more suspenceful but was disappointing. It's a little odd how reflective and emotionally aware the first person protagonist is but only in retrospective... He lives a lifetime constantly unable to correct for problems he is aware of and accepts. It's a very enjoyable and underrated book, but that one major flaw is distracting. I vacillated between 2 and 3 stars for this book. Ultimately, there was waaay more detail about plumbing, pipes and house construction than I needed or wanted. And man, what a passive, pathetic main character. I gave this a try for about 5 minutes because the author has been in the news. The writing didn’t work for me. Gave up. This book was different from what I thought it would be. It is a very relatable story of an American family and the struggles between father and teenage son. My rating for this book was a tough choice. MacKenzie Bezos is a very talented writer, and the story was well crafted and told. But my 3-star rating is a reflection of my not liking the narrator, nor the effect of his actions, and what Bezos puts us through to understand the character. I encountered Mackenzie Bezos for the first time when she was interviewed in mid-June by Charlie Rose. I was fascinated listening to her describe her process, and intrigued by her as a writer because she was so pa My rating for this book was a tough choice. MacKenzie Bezos is a very talented writer, and the story was well crafted and told. But my 3-star rating is a reflection of my not liking the narrator, nor the effect of his actions, and what Bezos puts us through to understand the character. I encountered Mackenzie Bezos for the first time when she was interviewed in mid-June by Charlie Rose. I was fascinated listening to her describe her process, and intrigued by her as a writer because she was so passionate and articulate. Her books include The Testing of Luther Albright and Traps. I started with the first. The dust-cover's description tells us, as does the title, that the narrator, Luther Albright, was being sorely tested by the events that took place during the Summer his son transitioned from boy to man. Bezos makes us viscerally feel that testing because we, the readers, are tested by Luther’s absolutely madding control. That includes the rigid control he keeps on everything in his physical surroundings, and on his emotions. To create this feeling in the reader---which I feel sure Bezos does purposefully---the events are told in minute, sometimes mind-numbing, detail. We readers are privy to Luther's thoughts, therefore know that his actions are nothing like what’s going on in his head. Luther realizes that his son, Elliot, is testing him, but he never gives his son what he’s clearly looking for. He believes himself to be a good father and husband, but he keeps his emotions so hidden from them that it borders on abuse. I thought that, in the end, Luther got what he deserved. I read this book sometime last year. Not sure why exactly, but this book sticks in my mind as one of the more interesting books I've read. I think most of the reviews on Amazon are pretty accurate, from what I saw, so I won't repeat them here. The opening line of the book starts, "The year I lost my wife and son, my son performed nine separate test of my character." Now, when I read that line, I interpreted the word "lost" a certain way. That caused me to expect certain things to happen in sto I read this book sometime last year. Not sure why exactly, but this book sticks in my mind as one of the more interesting books I've read. I think most of the reviews on Amazon are pretty accurate, from what I saw, so I won't repeat them here. This is a very sensitively written book. The protagonist is a man who suffers from tremendous insecurity as a result of a difficult relationship with his own father. The man is now married and a father of a teenage son. There are many tests in the relationship. The deep introspection and reflection of the main character is quite interesting, though it seems a little forced. Worth a read for those who find family dynamics interesting. Uncorrected proof from the library. Nothing really happens on this book. The first sentence is, "The summer I lost my wife and son, he challenged me nine times. " I spent the whole book worrying about how and when they'd die. I read this book quite quickly, even though I didn't absolutely love it. Very descriptive writing, which sometimes I'm not patient enough to get through! Well written although sometimes it felt like everyone was thinking to hard - but maybe that was the point. This book was very strange, but impressive in a really low key way. What I liked about it was how it described the emotional backlash that can occur over successive generations. Good story and characters. The prose style at times was unnecessarily complex. I found this to be quite the interesting read. I found myself surprised at the protaganist's dilemnas, thinking he was reading way too much into the ramifications of his choices.